In 1540, Zamumo, the chief of the Altamahas in central Georgia, exchanged gifts with the Spanish conquistador Hernando de Soto. With these gifts began two centuries of exchanges that bound American Indians and the Spanish, English, and French who colonized the region. Whether they gave gifts for diplomacy or traded commodities for profit, Natives and newcomers alike used the exchange of goods such… as cloth, deerskin, muskets, and sometimes people as a way of securing their influence. Gifts and trade enabled early colonies to survive and later colonies to prosper. Conversely, they upset the social balance of chiefdoms like Zamumo's and promoted the rise of new and powerful Indian confederacies like the Creeks and the Choctaws.Drawing on archaeological studies, colonial documents from three empires, and Native oral histories, Joseph M. Hall, Jr., offers fresh insights into broad segments of southeastern colonial history, including the success of Florida's Franciscan missionaries before 1640 and the impact of the Indian slave trade on French Louisiana after 1699. 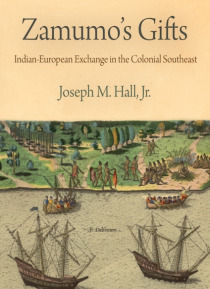 He also shows how gifts and trade shaped the Yamasee War, which pitted a number of southeastern tribes against English South Carolina in 1715-17. The exchanges at the heart of Zamumo's Gifts highlight how the history of Europeans and Native Americans cannot be understood without each other.